The last few years have seen an explosion in the number of tools available for us to communicate not only at a consumer level, but also in the context of our workplace both internally within companies and externally between companies. I’m actually a fan and regular user of many of these other than email. I use Microsoft Teams internally quite heavily, along with Yammer for cross company communication and Twitter for more widespread public broadcast and consumption. I’m also not unknown for shooting off a quick message on Skype or sharing something or reaching out to someone on LinkedIn. Folders – Users can create a folder structure that makes sense to them for organising email. They are not locked in to only viewing messages in the order and “buckets” it’s presented to them in, which isn’t the case for many other platforms where it’s usually a case of one shared view that has to fit everyone. Followup actions with reminders – Emails can be flagged for followup at a specific date/time because often communication is requested something of us or requires a reply or some action in return. In contrast, most other message system provide rigid ways of viewing messages and unless requests are dealt with in a short time frame, they are easily and quickly lost in the noise. The users have very limited options for organising the messages in a way that suits them. With email, the sending party and the receiving party both have a copy of the email that they can govern according to their information management policies. This becomes particularly important when that email contains information that needs to be treated as a record, or if important information is stored as an attachment. The attachments on an email can be both an advantage to email and it’s Achilles heal. Too often people send around a document (that is a work in progress) and you end up with no version control and people working on multiple different copies of it. A much better scenario is to have the file stored in a central system (e.g. SharePoint or OneDrive) and share out a link to the file so everyone can work on the same file. Once the file is completed though, and especially if it is an important document or deliverable to an external company – that document is of high importance as a record to both parties. By sending the file via email both parties have their own copy to retain for their records. Imagine if you were issued with a project scope document which you agree to (which is stored in the sending companies Document Management system) – you view and read the document via a link into their system. Now it comes time to deliver the project and they fall short on delivering to the agreed scope. You go back to look at that project scope document only to find you no longer have access! Not a situation many businesses would allow themselves to get into. So while external sharing works during the collaboration process, I don’t think it would satisfy the document management or records management requirements of both sides involved. You can rely on anyone you want to communicate with having an email address. The same can’t be said for any of the other platforms. Unless you communicate with someone regularly, you probably have no idea what messaging platforms they use, and it’s a large burden to put on someone to force them to create an account and join up to a messaging platform or social network just so you can communicate with them. Knowing that not everyone is going to be on the same messaging platform implicitly means that this is not going to scale and you are either going to have to use multiple messaging platforms or fall back to a common platform that everyone has at times – which is email. Most people I speak to would love to have more time in their day. They struggle to process all the information that is thrown in their direction and to stay on top of what they need to action and respond to. Take myself, I get messages and information coming at me from email, Yammer, LinkedIn, Teams, Facebook, Twitter (and I’m sure their are others). If I had all the time in the world I would proactively go to my email client, Yammer app, LinkedIn app, Teams app, Facebook app and Twitter app to check those unread notifications and unread messages in feeds. This works if you’ve got time to “do the rounds” constantly and respond immediately, but that’s rarely the reality. What I find happens with most people (myself included) is that for each of the messaging platforms I go into the settings and I get it to notify me of any direct messages by sending me an email, and maybe get it to send a summary email every day/week of the top things I’ve missed (if the platform supports this). Now I just have to monitor my email inbox and I’m not going to miss anything important (like a direct message to me) and I have a rich toolkit to set followup flags, categories and reminders. If I’ve got time then I might go to the individual apps and use their beautiful interfaces to stay on top of things, but the majority of the time I’m content that anything important will come to me in my inbox. Don’t integrate with other messaging platforms – how great would it be if a Facebook user could send a message to a Twitter user or Teams user? One standard for messaging between platforms? Great I don’t have to join a heap of different providers and setup all these accounts, sounds wonderful; But what do these companies stand to make out of that? It’s not going to increase their active user count. To the contrary, no company “owns” email. A lot of companies provide email services, but the email protocol is well known and these system will all happily talk to each other and we enjoy an email environment where we can send a message to someone else without having to consider the email provider they are using. It is usually possible to export email and take it with you should you want to change email providers or systems. This type of export or change of provider just doesn’t make sense in most modern messaging platforms. For these reasons, if I were forced to only keep one messaging platform and had to throw away the others, email is the one that would stay. I recently spoke with Jeremy Thake in an interview that discussed the place of email in the Microsoft ecosystem that discusses these topics and more. Vote for our app in the Office 365 Hack Productivity competition! Microsoft is currently running a Hack Productivity competition for creating apps that leverage Office 365 Add-ins and/or APIs to deliver an app that increases user productivity. 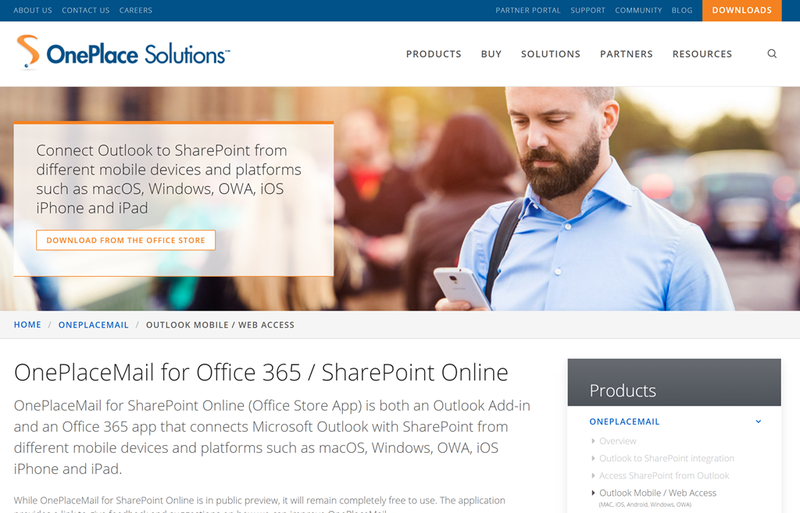 I’ve been working with the awesome dev team at OnePlace Solutions to cook up a modern Outlook Add-in that will run on any device and allow a user to quickly and easily save email and/or attachments from Outlook to SharePoint/Office 365 Groups. We think it’s an awesome productivity app as it makes use of the “dead-time” you get during the day when you haven’t got time to do any heavy work but have your phone or tablet handy. This allows you to do those tasks like filing emails into your Project Management System in SharePoint while catching the train to work, or saving that updated document you’ve been sent into your Legal Matter Management System in SharePoint while waiting for your doctor’s appointment. We are using all the cool technologies to make the magic happen. Running as a super fast Angular 2 Outlook Add-in and looking very slick thanks to the Office UI Fabric! We are utilizing the Microsoft Graph, SharePoint and Exchange services of Office 365 and hosting the app 100% on Microsoft’s Azure Cloud. We didn’t just cobble together an app for the Hackathon, we built this app to be ready for the prime time and it will become a commercial product offering in the very near future. We have released the app into the Office Store as a preview where you can take a look at what we’ve built and try it out for yourself. 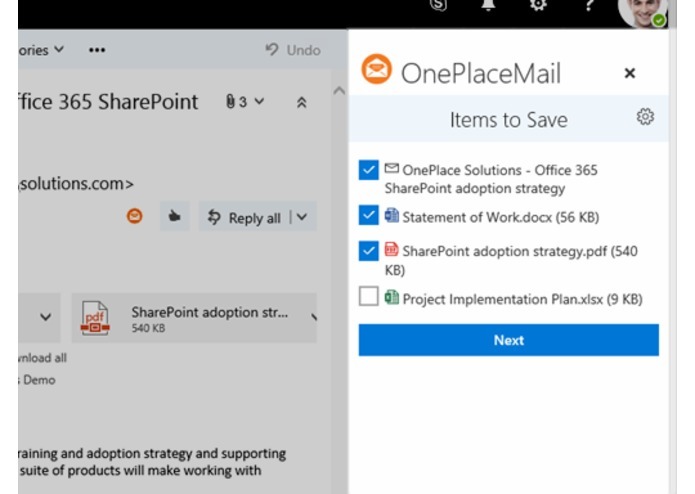 Get the OnePlaceMail for SharePoint Online preview app from the Office Store today. OnePlace Solutions is proud to be an exhibitor and sponsor again this year at the Microsoft Ignite conference in Atlanta. Ignite is Microsoft’s premier conference this year for Office 365, SharePoint, Exchange, Azure, Windows and related technologies. I’ll be on the OnePlace Solution booth (#563) during the conference talking about our suite of products that bring SharePoint and Office 365 to where you work such as Outlook, Word, Excel, PowerPoint, Adobe Acrobat, and Windows Desktop. I’m very excited to be unveiling our latest product OnePlaceConnect at the conference. 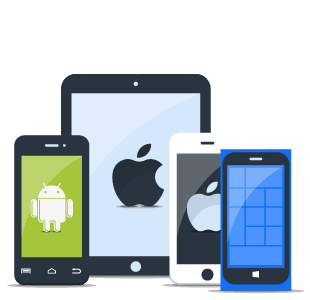 OnePlaceConnect is focused on bringing cloud based solutions such as Office 365 and SharePoint directly into the applications you use, on whatever device you use them (yes that means on your iPad/Android tablets, phones, Mac and of course your Windows devices). Registration is now open to participate in the OnePlaceConnect Preview and be one of the first to get your hands on the new product. The following are some really useful resources that I often refer people to at conferences. It’s always fun meeting new people at conferences and hearing of successes, challenges and battle wounds you’ve had with technology. It’s also awesome to catch up with existing customers and partners while I’m in the US as well, so please drop by the OnePlace Solutions booth if you get a chance. We will have some swag at the booth, and we have new and improved hacky sacks/footbags/juggling balls to give away this conference. I’m more excited than I probably should be about those! We will also be giving away a Microsoft Band 2, so make sure you drop by for your chance to win. Have a great conference and hope to see you at the booth or one of the many events. Reach out to me @CameronDwyer on Twitter during the conference. I’m preparing to head down to Melbourne for the The Digital Workplace Conference (the new Australian SharePoint Conference). This will be the first conference since the 7.3 release of OnePlaceMail and OnePlaceLive. I’m pretty excited about the new Email Tracking features which goes well beyond simply allowing users to transfer email and attachment from Outlook to SharePoint. This goes to a whole new level. Save an email to SharePoint (or Office 365) and all other recipients of the email can see in real time that you have file it to SharePoint and can open up the location in SharePoint. No more having multiple people trying the file the same email to SharePoint to find that someone has already save it there. Or worse, people saving it to different locations in SharePoint and having the files duplicated. 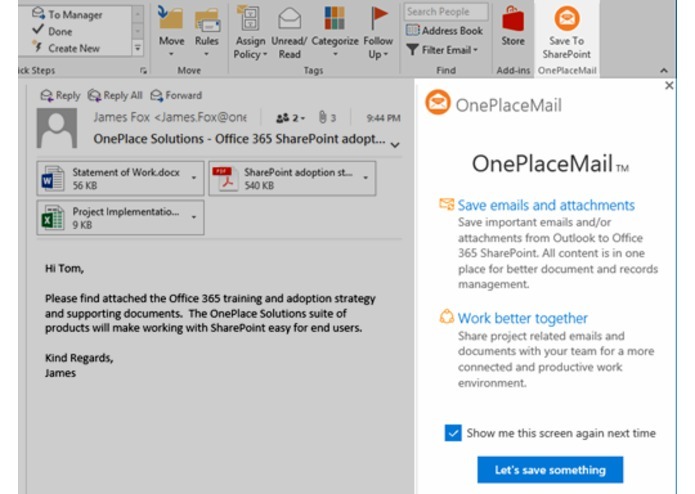 If you haven’t checked out the OnePlace Solutions suite in the last few months you may have also missed the suggested and predictive email filing capabilities that analyze the filing patterns of users and will suggest or predict locations in SharePoint that are likely locations you would want to save the email. If you’re not going to make it to see us at the Melbourne conference (or simply can’t wait that long to see what I’m talking about) here’s a short video on the Email Tracking feature. See for yourself how just one feature can make the Digital Workplace so much easier for a user, then imagine a whole suite of products packed with features like this, then come and see me at the conference! Failed to deploy the manifest file to the Exchange server. This app can’t be installed. The manifest file doesn’t conform to the schema definition. The element ‘Resources’ in namespace ‘http://schemas.microsoft.com/office/mailappversionoverrides’ has invalid child element ‘Images’ in namespace ‘http://schemas.microsoft.com/office/officeappbasictypes/1.0′. List of possible elements expected: ‘ShortStrings, LongStrings’ in namespace ‘http://schemas.microsoft.com/office/officeappbasictypes/1.0′... The element ‘Resources’ in namespace ‘http://schemas.microsoft.com/office/mailappversionoverrides’ has invalid child element ‘Images’ in namespace ‘http://schemas.microsoft.com/office/officeappbasictypes/1.0′. List of possible elements expected: ‘ShortStrings, LongStrings’ in namespace ‘http://schemas.microsoft.com/office/officeappbasictypes/1.0′. After a bit of trial and error I discovered that the issue was to do with the order of child elements within the Resources element. It appears that there is a strict order that must be adhered to. Here’s the code that was causing the error. Notice that I was defining Urls before Images. This is a continuation of an article I wrote back at the beginning of 2012 Five out-of-the-box ways to get Email into SharePoint. Since then we have seen the launch of SharePoint 2013 and also more widespread adoption of Office 365 (SharePoint Online). These more recent versions of SharePoint have introduced new ways of getting email into SharePoint and that’s what we will explore in the article. 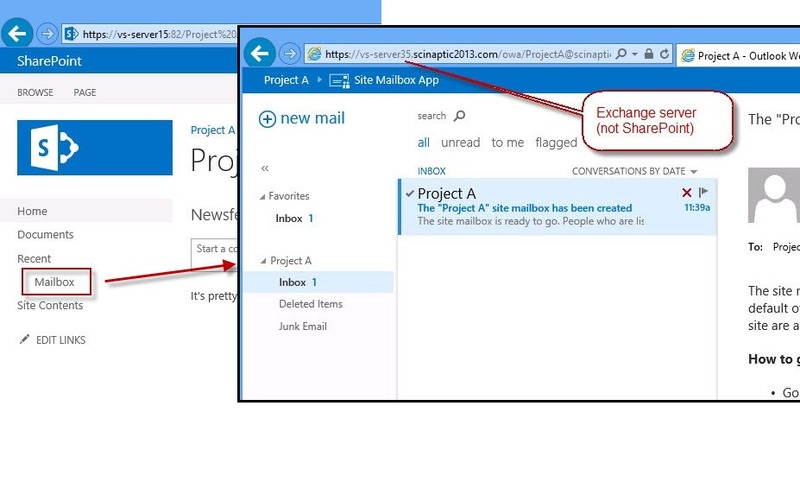 The Site Mailbox concept introduced in SharePoint 2013 promised a lot and sounded like it could be the primary option to go for when trying to integrate email and SharePoint. Rather than reproduce existing content here’s an article I wrote dedicated to SharePoint 2013 Site Mailboxes. 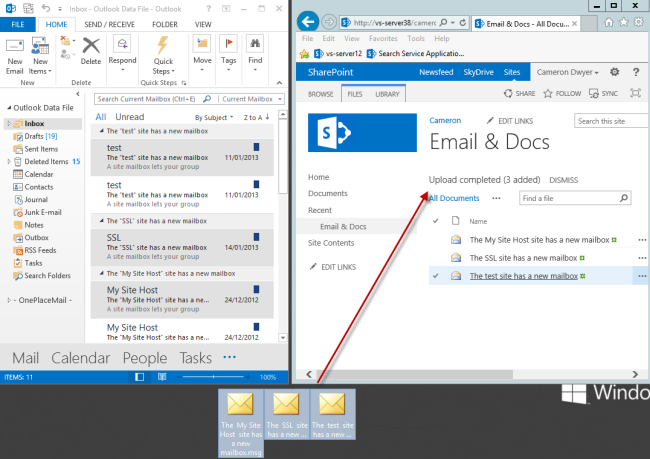 Convenient access to SharePoint content from within Microsoft Outlook using a familiar metaphor of folders on the left navigation of Outlook. Ability to ‘Forward’ a link to a document within a Site Mailbox or drag/drop multiple documents into an email message. Management and Compliance: Site Mailboxes can be part of eDiscovery Search Scopes. Setting up the environment to support Site Mailboxes involves installing and configuring software on both the Exchange and SharePoint servers and setting up trust relationships and having all communication over SSL. Probably the biggest drawback is that you are not actually getting email into SharePoint. The email is stored in Exchange. This means you can’t treat it as a SharePoint object and include it as part of a business process. E.g. include it a part of a workflow, add metadata columns to email and build a SharePoint business process around it. I will add quickly that you can drag/drop email directly to a Document Library and this will get the email into SharePoint as an msg file. Viewing of SharePoint content is very limited. You are provided more with a file type view of content rather than a SharePoint view. You can’t show SharePoint columns in the Outlook view, you just get the filename, last modified, size, and checkout status. SharePoint 2013 provided the new capability of being able to drag and drop files from your computer directly into a SharePoint document library open in a browser window. Combine this with the ability to turn Outlook messages into msg files by dragging them of of Outlook onto the desktop and we have a fairly simple 2 step process. Thanks goes to Liz who posted a comment on this blog letting me know of this technique. The email is stored in msg format so it can be opened back up in Outlook without loss of data or email integrity. Getting the Outlook and SharePoint windows accessible and seeing the desktop behind them to be able to execute the drag drop can be a bit fiddly so lends itself more to doing the transfers in batches rather than just ad-hoc when new email arrives. OneDrive for Business is essentially a synchronization tool that lets you take a copy of a SharePoint library locally onto your machine. The document library appears in Windows Explorer as a folder with the documents appearing as files within the folder. Subfolders within a library are also supported. The nice thing about OneDrive is that it’s a 2 way sync. Any additional files you add to the local sync folder will get transferred up to SharePoint. Step 1: Browse to your library in SharePoint and click on the sync button to have the SharePoint library sync’d via OneDrive to your local machine. Step 2: You can now open an Email in Outlook and choose to Save As and choose the OneDrive local folder as the save location. Alternatively you can open the OneDrive folder in Windows Explorer and drag/drop multiple emails directly from Outlook to the OneDrive folder. 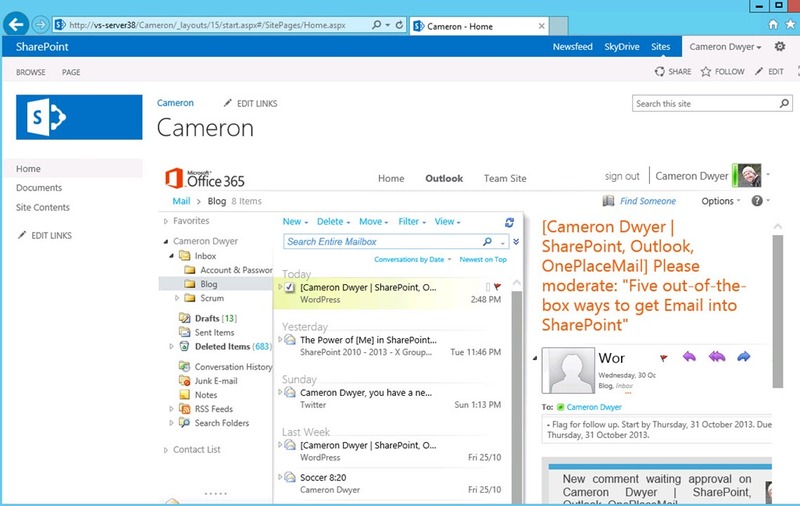 OneDrive will automatically upload these emails to SharePoint in the background. Using email Save As is tedious, drag and drop to OneDrive open in Explorer window is much nicer but it’s fiddly to get the windows visible to achieve the drag/drop so probably works better transferring in batches rather than as new email arrives. 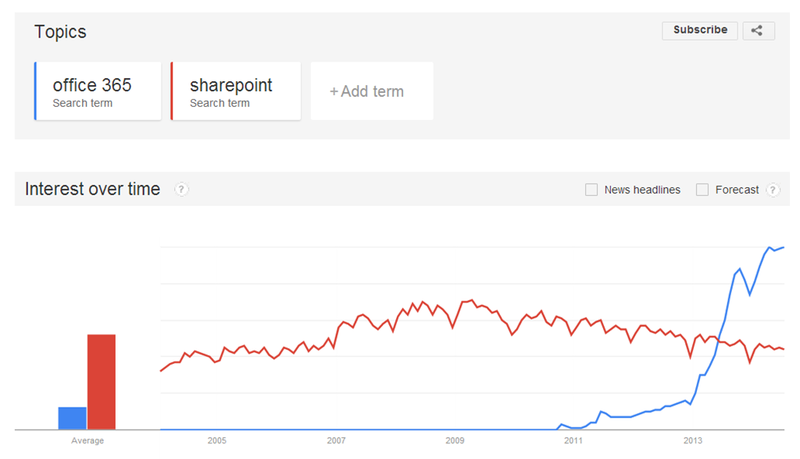 Is the SharePoint brand going away? 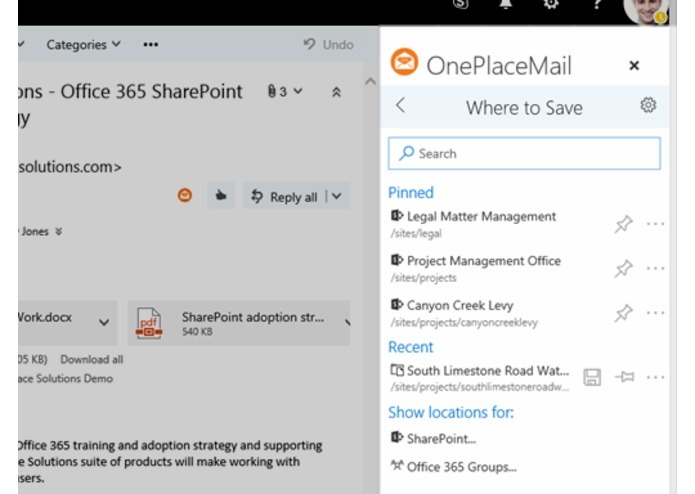 The big push from Microsoft over the last few years has been towards the cloud, and in the SharePoint area this means Microsoft wants you on Office 365 instead of on-premises SharePoint servers. None of this should shock you, Microsoft has been yelling it loud and clear for some time now, and the message came through loud and clear at the SharePoint Conference in Las Vegas this year (my key takeaways from the SPC14). It has now been announced that was the last SharePoint conference and starting in 2015 a conference combining SharePoint, Lync, Exchange, Project, Office365 will run instead. Here’s some interesting stats pulled from Google trends. Office 365 (blue) vs SharePoint (red) – Shows interest in SharePoint slowly declining while interest in Office 365 has been rapidly increasing to roughly double that of SharePoint. Microsoft’s Office 365 offering is compelling now they are starting to realize the benefits from combining multiple services into a single integrated offering. I don’t necessarily think Microsoft is trying to kill SharePoint off, it’s just drifting towards the background a bit in the noise of Office 365. When you look at Office 365, there are quite a few products that were thrown into the mix… SharePoint, Exchange, Yammer, Office Online, OneDrive, FAST. Trying to combine and integrate these products and leverage their combined power, Microsoft is heading towards talking about the tangible objects and features rather than the technology.. what do I mean by that? We start hearing terms like Conversations which may be a mixed thread of Email/Lync/Yammer all shown together, we start to talk of Documents whether they be stored in SharePoint and viewed with Office Online Apps, Office Desktop apps or accessed via OneDrive. It seems the technologies themselves are losing the focus and the rather the functionality they provide is coming to the fore (and I think this is where the rub comes for those hanging on to SharePoint on premises), this really awesome functionality is not provided by one product on it’s own, but rather when they are integrated together and the only way to get the highest level of integration and deliver this value is in Microsoft’s Office 365 cloud. So is SharePoint going away? I think it’s just becoming part of something bigger, and over time the functionality might just be called Sites or Workspaces or Places or Groups in Office 365 but it will essentially be the SharePoint of today powering the functionality delivered in the Office 365 of tomorrow. 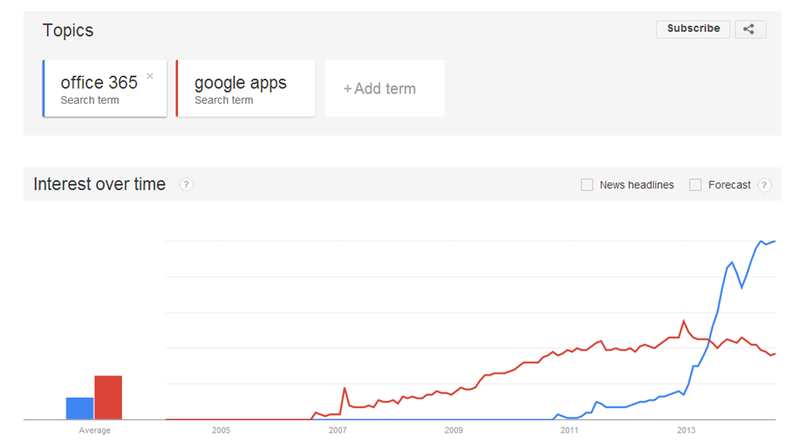 Office 365 (blue) vs Google Apps (red) – Office 365 is competing with Google for taking business apps to the cloud and looking at Office 365 vs Google Apps or Google Docs these stats show a pretty fierce battle underway. 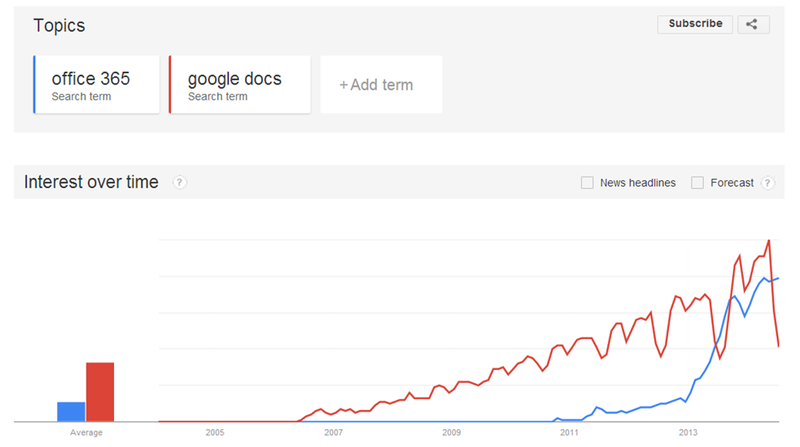 Office 365 (blue) vs Google Docs (red) – Office 365 is competing with Google for taking business apps to the cloud and looking at Office 365 vs Google Apps or Google Docs these stats show a pretty fierce battle underway. SharePoint 2007 and SharePoint 2010 had a series of Web Parts dedicated to surfacing and interacting with an Exchange mail account directly from a page in SharePoint. These Web Parts are most useful for your My Site, because only you (or someone who can log into your Exchange e-mail account) will be able to see the information from your folders. If you put one of these Web Parts on a shared site, other users will see the Outlook Web Access logon screen in the Web Part. Each Web Part displays the information from a folder in your email account, so you can choose the information you want to show on your site. The Web Parts make it easy to show specific information, such as tasks, without showing all of your Outlook information. If you want to have full Outlook functionality on your SharePoint site, you can use a Page View Web Part linked to the URL for your Outlook Web Access server. All of the Outlook Web Access Web Parts provide two-way communication with your Exchange Server e-mail account: Changes you make in a Web Part appear in Outlook. 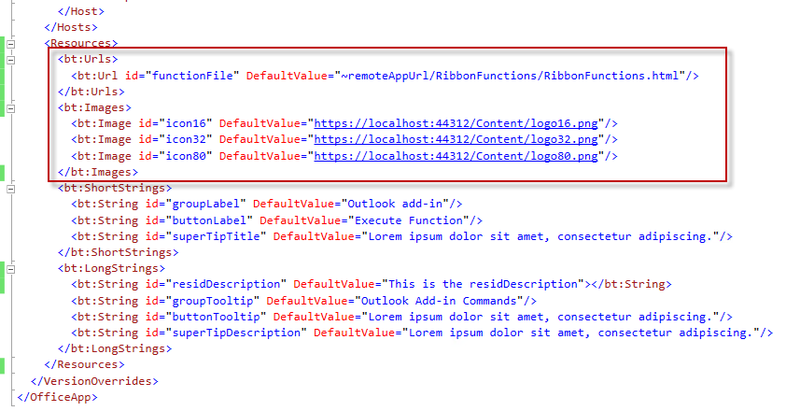 What’s the Story with OWA integration in SharePoint 2013? I was somewhat surprised when SharePoint 2013 arrived and all the Outlook Web Access web parts were missing. Had this been an oversight by Microsoft and they would reappear again in a cumulative update for SharePoint? It appears not. The statement above alludes to an alternate method using the Page Viewer control (which to be honest I’d prefer to the OWA web parts which didn’t have the full functionality of the OWA interface). The idea behind using the Page Viewer web part is that OWA is just a web interface to your Exchange account served up at known URLs. So just wrap these in a iframe (Page Viewer web part) and you will have your full OWA interface embedded inside a SharePoint page. For a step by step guide of how to setup the Page View control to connect to Exchange Online (OWA) take a look at this article by Jesper_Osgaard. So fast forward to SharePoint 2013, can we still use the Page Viewer web part technique? My experience so far has yielded mixed results. More often than not the Page Viewer technique gets tripped up with security issues. I think the underlying issue is that an Internet Explorer session cannot handle authenticating with multiple domains at the same time and it just so happens SharePoint Online and Exchange Online reside in different domains. This isn’t to say it flat out doesn’t work. Here’s a screenshot to prove it (no smoke and mirrors or Photoshop involved I promise). But I just didn’t find it stable enough to recommend it as a viable solution. On reflection it would seem that Microsoft wasn’t able to iron out the complexities of integrating OWA content and SharePoint content in the same Internet Explorer session. If they could, then surely that would have provided better integration for the native SharePoint Site Mailboxes that were introduced in SharePoint 2013 (Exchange 2013). 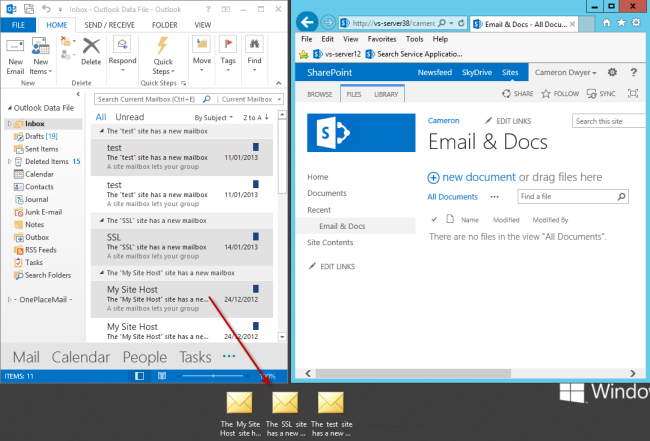 When a SharePoint Site Mailbox is provisioned, a mailbox is created in Exchange (for the SharePoint site) and a link is placed on the left navigation of the SharePoint site. When you click on the link you don’t get the mailbox content embedded in the SharePoint page (as you might expect and have hoped for!). Instead it launches a new Internet Explorer window (new IE session that can authenticate with a different domain) and opens the OWA URL directly to the mailbox. There’s essential no integration with the SharePoint UI other than a URL link. I’ve just been reading Tony Redmond’s article on one of the new features introduced in Exchange 2013 CU1. The ‘new’ public folders are now available within Outlook Web Access (OWA). Unlike previous Public Folder (in Outlook and OWA) you don’t get the full hierarchy. Rather the user selects which folders (from anywhere within the hierarchy) to add to there Favorites. Public folders can only have one set structure, but that’s not necessarily how every user sees it and often it exposes a lot of ‘clutter’ that the user is not interested in. Having the user select their favorite locations removes the clutter. I would like to see the favorites area enhanced so that the user can categorise (or add levels of categories) to their favorites. This way the user can organise and structure favorites in a way that makes sense to them. This gets away from the issue of the old Public Folders where everyone must see the hierarchy in the same way. Allowing users to make up their own hierarchy of favorites allows them to organise the world how they see it and how it makes sense to them. I find this freedom is what keeps users happy and productive. Users are familiar with this in Outlook… take your common mail folder structure (i.e. inbox and subfolders the user creates). This works because users create mail folders ad-hoc and how it makes sense to them and what they are working on day to day. Allow them to categorise and move around shared Public Folders in the same way and everyone is happy. It’s an approach we’ve been using in OnePlaceMail to allow users to organise their SharePoint locations in Outlook for years, and it works. The Exchange Server 2013 RTM Cumulative Update 2 is now available through the Microsoft Download Center. For more details on the new features and how to install the update please refer to the Exchange Team Blog article.